Closer to average this month after the hottest and driest January. A mean temperature anomaly of +0.6 compared to 1981-10 or +0.8 compared to 1961-90. 31mm of rain fell on the night of the 6th into the 7th as low pressure formed over Tasmania. This was amplified by humid air from the North Queensland floods and a trough crossing from the north-west. For the remainder of the month Southern Ocean frontal systems saw cooler periods but only a shower or two making it over the Western Ranges. There was a cool onshore south-east wind with low cloud and brief drizzle on the 23rd as high pressure built to the south west, producing the coldest day. By the 25th high pressure was to the east, with a hot airflow from the mainland. A very mild month after a very cold start mainly down to the very high maxima with minima being only a little above average. It was the mildest February since 1998, and the driest since 2012. 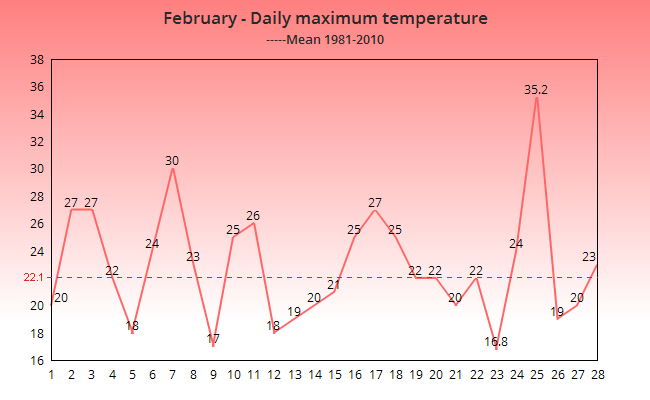 The February maximum was the highest on record and the minimum was also the lowest since 2010. This is by far the driest and sunniest winter in my records. 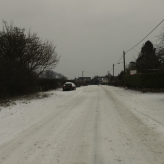 The entire month was below freezing with the highest temp recorded -2.9c on 27th. Rainfall only 11.6 which is less than half the average; the wettest day gave 6.8 on the 7th; there were 5 days with 0.2 mm or more and 4 with 1.0 or more.